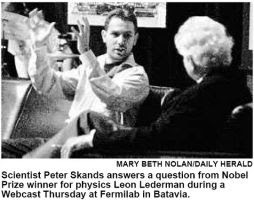 During a 2005 Q&A session with Nobel Laureate, Leon Lederman, Fermilab scientist Peter Skands points out that "if the Higgs boson exists, and if it is the way the Standard Model predicts it to be, then it must have a mass greater than 114 GeV". More recently there have been experimental indicators that the mass of the Higgs Boson could lie in the region 155-180 GeV (Giga electron Volt). But then this increased speculative mass is often rather unfairly seen as an attempt to garner funding for larger (higher energy) particle accelerators, capable of detecting higher mass particles. Repeated attempts have so far failed to find this much sought after and elusive particle. There is a general consensus among physicists that anyone associated with the possible finding of this particle is assured a Nobel Prize. Dubbed 'The God particle' and 'The Holy Grail of particle physics', the Higgs boson is a hypothesised particle which, if it exists, would give the mechanism by which particles acquire mass, thereby affirming the best theory that physicist's have today to explain the origin of mass. It is safe to say, that if it does not exist, it would shake the foundations of theoretical physics to an extent that new interactions, fields and laws that bind them may need to be conjured up. So in a way, its absence may be as valuable for us as its presence. There is a rumour going around right now, that the Higgs Boson may have been found by Tevatron physicists working on the D0 (pronounced D-Zero) experiment at Fermilab, Batavia near Chicago, USA. There have been optimistic articles about observed 'bumps' in the data before, so we'll have to wait and watch to see if the current evidence from the Tevatron D0 data holds up, amidst the clutter of data from competing labs.